Read, hot & digitized: Librarians and the digital scholarship they love — In this series, librarians from UTL’s Arts, Humanities and Global Studies Engagement Team briefly present, explore and critique existing examples of digital scholarship. Working as a book conservator back in the days in Tel Aviv, I was always intrigued by the notes and scribbles found on flyleaves, covers, and pages of centuries-old books. It seemed that this text, which supposedly was not related to the actual content of the book in hand, had its own story to tell – about places, people, and events. Now this data is playing the main role in Footprints; these pieces of information could be interlinked, and show us a new spatial landscape of Jewish texts through generations. The goal of the project, a collaborative initiative by the Jewish Theological Seminary, Columbia University, University of Pittsburgh, and Stony Brook University, is to create a “database to track the circulation of printed ‘Jewish books’ (in Hebrew, other Jewish languages, and books in Latin and non-Jewish vernaculars with Judaica contents).” Those notes, scribbles, and ‘marginal’ pieces of information are scattered in many forms. Footprints lists many types of evidence while documenting the movement of books, and presents visualizations of mobility, including mapping. Some types of evidence include owners’ signatures and bookplates; handwritten notations of sales; estate inventories; references to exchanges of books in correspondence of scholars or merchants; unpublished booklists copied in flyleaves; printers’ colophons; subscription lists, and lists of approbations indicating backers or patrons of the books who presumably received a copy of the product. Take for example the literary work titled ʻAḳedat Yitsḥaḳ (“the Binding of Isaac”) – a collection of philosophical homilies and commentaries on the Torah by Isaac ben Moses Arama (1420-1494). This text is represented by five different imprints. Each imprint is represented by various unique copies, and each copy has between one to nine ‘footprints.’ For example, the imprint published in 1547 in Venice, Italy, has five unique ‘holdings’ in the database. One of these copies is traced through six different ‘time stamps’, owners, and locations, from 1599 (Modena, Italy) through 1986 (New York, NY). Another fascinating example is the journey of a copy of Masekhet Nedarim (a Talmudic tractate) printed in Venice in 1523. In 1663 it was bought (and sold) in Yemen. Between 1842 to 1894 it was owned by Alexander Kohut in New York, and since 1915 this particular copy has been owned by Yale University, New Haven, CT.
Librarians and researches from Europe, Israel, and Unites States are constantly adding new information and validating accuracy of current entries. The database currently includes 7638 unique footprints, and is searchable by keywords, footprint year, and publication year. Here in Austin, The Harry Ransom Center is also collaborating with Footprints; data gleaned from the Center’s early Hebrew books holdings, mainly those dated pre-1800, will be uploaded soon to the database. Footprints is an open-source and open-access tool; it uses a PostgresSQL, an object-relational database system, which is available on Github. As such, it is both a digital humanities project and a global collaborative project. The digital platform makes public the very process of scholarship performed by trusted crowd sourcing. The collaborative platform invites immediate feedback, editing, and revision. The project owners anticipate future uses to include inferential statistical analysis and network visualization. They anticipate that “cultural historians and statisticians would leverage their mutual areas of expertise to offer a statistical analysis that takes into account social, cultural, political, and economic contexts.” In addition, they plan to visualize networks of book movement showing connections between places, and networks connecting individuals to each other or to other places. Footprints brings to mind Bakhtin’s Chronotope, where time and place are merging into one meaningful experience. A physical printed book travels through times and places; created, owned, and used by various individuals, carrying with it ideas and intellectual meaning. A Chronotope of the Jewish book, Footprints is a multidimensional bibliography, which highlights and makes use of previously unknown resources in a way that re-imagines the practice of Jewish book history. Pearson, David. 2007. “What Can We Learn by Tracking Multiple Copies of Books?” In Books on the Move : Tracking Copies through Collections and the Book Trade, edited by Robin Myers, Michael Harris and Giles Mandelbrote, 17-37. New Castle: Oak Knoll Press ; London : British Library. Walsby, Malcolm and Natasha Constantinidu, eds. 2013. Documenting the Early Modern Book World: Inventories and Catalogs in Manuscript and Print. Leiden: Brill. Dweck, Yaacob. 2010. “What is a Jewish Book?” Association for Jewish Studies Review 34: 367-376. Read, hot & digitized: Librarians and the digital scholarship they love — In this series, librarians from UTL’s Arts, Humanities and Global Studies Engagement Team briefly present, explore and critique existing examples of digital scholarship. Our hope is that these monthly reviews will inspire critical reflection of and future creative contributions to the growing fields of digital scholarship. The Infinite Atlas includes fictional and fictionalized locations unique to Infinite Jest. The Ennet Drug and Alcohol Recovery House is set in the town of Ennet, a fictionalized version of Boston’s Brighton neighborhood. The Infinite Atlas is built on Google Maps, with design work by the firm JESS3 and programming from the web development company Red Edge. (It’s unclear if Beutler paid for the design and programming.) Beutler credits his friends and family for helping him with data collection, which included going through all 1,000+ pages of Infinite Jest one-by-one. The project also allows users to create their own locations and upload photos and descriptions, so the Atlas has expanded beyond the Boston area. What can academic institutions take away from this project? What strikes me is the dedication, love, and passion Beutler and his friends brought to it, and their continued maintenance of the Infinite Atlas. Maintenance of digital projects is an ongoing issue for academic institutions and libraries, which can’t afford trendy design firms. However, we can learn from the Infinite Atlas team’s dedication. We should choose projects that we are passionate about, ones that we will care for and attend to in the future, much in the same way we care for our physical book collections. This is the Infinite Atlas entry for Ryle’s Jazz Club in Cambridge, which was the setting of a notable scene in Infinite Jest and is a place you can actually visit. This project also has interesting implications for scholars. Infinite Jest is a very difficult book. It is long, convoluted, and full of footnotes. It requires stamina of its readers. If the novel is, as Lattanzi suggests, a fragmentation of Wallace’s experiences in Boston, it is logical that fans would try to make sense of that. Beutler told Fast Company in 2015, “I re-read Infinite Jest after Wallace’s passing, and became obsessed with the idea that there was a way to treat Infinite Jest as a very large data set.” The Infinite Atlas is an attempt to better understand this novel through data, and that is one of digital humanities’ primary goals. Furthermore, the Infinite Atlas could be an object of study unto itself. It is, in a way, a primary source potentially useful for scholars interested in reader response to Wallace’s work. In the universe of digital projects, a non-academic work like the Infinite Atlas is an intriguing example because it challenges our notions of scholarship and leads us to other potentially better questions. You can find editions of David Foster Wallace’s fiction and non-fiction, including Infinite Jest, at the PCL, where you can also find critical and scholarly works on Wallace’s writing. Bill Lattanzi, “Messing with Maps: Walking David Foster Wallace’s Boston,” Los Angeles Review of Books, February 6, 2016, https://lareviewofbooks.org/article/messing-maps-walking-david-foster-wallaces-boston#! No discussion of Infinite Jest would be complete without its own set of self-aware footnotes. Increasingly simple and cost-effective digital technologies have made capturing and distributing oral histories a robust and growing field for archivists and for researchers, and, by extension for students and scholars seeking primary source, personal narratives to augment their understandings of history. One of the most compelling South Asian oral history projects is the 1947 Partition Archive. The Archive’s mission is to preserve eyewitness accounts from those who lived through the exceptionally turbulent and violent period when the Indian subcontinent gained independence from Britain, divided into the nation-states of India and Pakistan, and millions of people migrated from India to Pakistan, from Pakistan to India, from India and Pakistan to other parts of the world. The work of the Archive is especially pressing: it has been 72 years since Partition and those still alive and able to directly recount their stories are increasingly rare. As such, the core of the Archive’s work is to use its digital platform to encourage and motivate more interviews. Using the power of “the crowd” to create content as well as to fund itself, the 1947 Partition Archive is demonstrably transparent in its methodologies; of particular use to those new to video oral histories is their “Citizen Historian Training Packet” which walks a novice through best practices for interviewing, strategies for good video capture, recommendations for incorporating still images into videos and even how to employ social media to generate interest (and potentially more interviews!). The Archive has gathered over 5000 interviews so far and uses a very persuasive interactive map (StoryMap) on its front page to document the scale and scope of migration while simultaneously indexing the interviews; on the map itself, try searching a city either in “migrated to” or “migrated from” to generate a list of interviews, many with detailed text summaries that can be easily shared through social media, email, etc. A handful of video interviews are available on the front page of the Archive’s website and raw, unedited recordings are available upon request. Recently the Archive has partnered with Stanford University Library to preserve and archive the recordings. To date, approximately 50 interviews are available through streaming on the site and (contingent on funding) one can hope for more to be available soon. On the Stanford site, one can navigate by language, author, place & date of recording, but those just beginning to explore the subject may find the “Today’s Story” a good place to start. The stories bravely shared through the 1947 Partition Archive are simultaneously compelling and devastating in their intimate descriptions of destruction, of violence, of loss. And yet, they also provide hope: all interviewees survived the ruin that was Partition and the very act of sharing their stories demonstrates a hope for and generosity towards future generations to learn from the past. The UT Libraries has an extensive collection related to Partition; those new to the topic might begin with a short story by Saadat Hasan Manto, “Toba Tek Singh,” a novel by Khushwant Singh, Train to Pakistan, or by Salman Rushdie, Midnight’s Children, or Vishwajyoti Ghosh’s curated graphic novel, This Side, That Side. The Puerto Rican Citizenship Archives Project (henceforth PRCAP) is a multi-institutional collaboration focused on the often-shifting legal relationship between the United States and Puerto Rico that began with the annexation of Puerto Rico in 1898. The project’s objective is to show this relationship through the lens of U.S. citizenship. 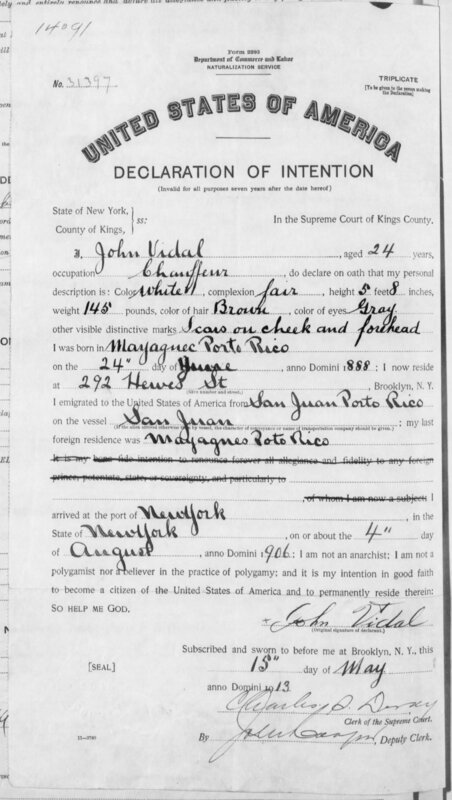 “Ind Naturalization,” PRCAP (PR Citizenship Archives Project), accessed November 27, 2018, https://scholarscollaborative.org/PuertoRico/items/show/108. The timing for this project is apt on multiple levels. More Puerto Ricans are migrating to the mainland than ever before and the United States’ poor handling of the fallout from Hurricane María further exacerbated that fact. Puerto Rico’s status as a free associated state, which many view as a mere extension of an outdated colonial model, continues to be a hot topic for scholars and citizens alike. Moreover, 2017 marked a century since passing the Jones Act, a legislative act that provided the collective extension of citizenship to a U.S. territory that was not a state. With that being said, the path to U.S. citizenship for Puerto Ricans has been far from easily defined. Since 1898, changing laws have provided Puerto Ricans with “non-citizen nationality,” a naturalized citizenship (both individual and collective), and “birthright citizenship.” PRCAP does an excellent job in documenting and detailing these legal changes through government documents. In some ways, this digital project, principally hosted by the University of Connecticut, is a foil to a lot of the digital scholarship permeating the internet these days. Whereas many of the digital humanities projects I find seem to be driven by visuals (i.e. mapping, timelines), PRCAP is a text-heavy site. This is not a slight on the work; rather, as their recent garnering of awards shows, this project is a welcome return to traditional research approaches and suggests the potential for less technologically inclined scholars to follow suit with their own worthwhile projects. Indeed, many of the site’s offerings include yearly governmental bills and acts to follow the trajectory of citizenship for Puerto Ricans. While more visual content could be beneficial, the webpage will be of great use to scholars working on Puerto Rican cultural studies at large, migration studies, political science, and law. 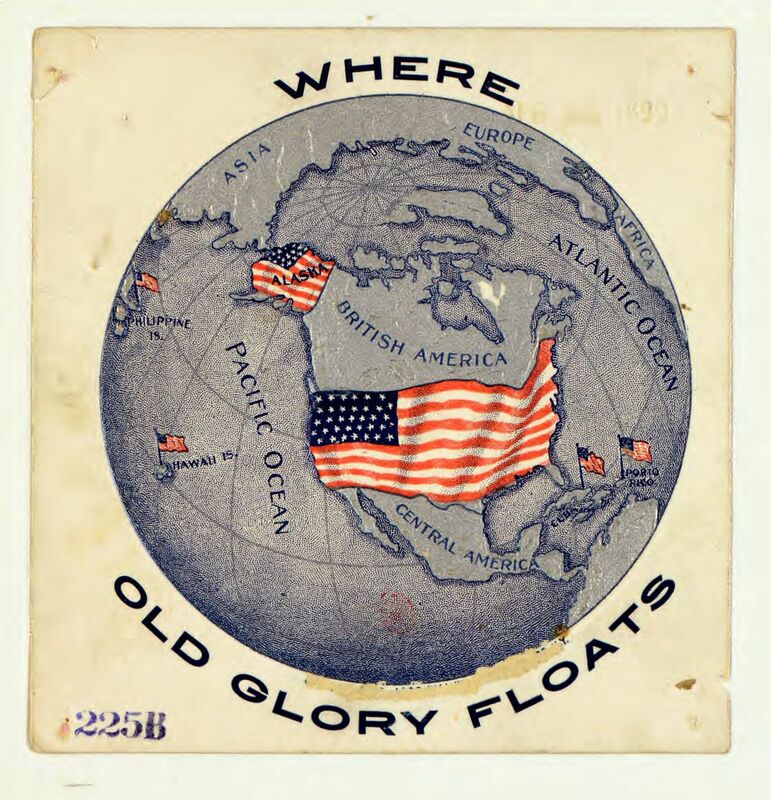 “Glory Flag,” PRCAP (PR Citizenship Archives Project), accessed November 27, 2018, https://scholarscollaborative.org/PuertoRico/items/show/117. Each bill comes with a plethora of metadata using Dublin Core standards to contextualize the text. Users can readily access the date of the proposal, the citizenship and legislation type, and even the sponsoring political party. One bill that interests me is the “2017 Bill to Recognize Puerto Rico’s Sovereign Nationhood Under Either Independence of Free Association and to Provide for a Transition Process, and for Other Purposes.” This bill gave congress the obligation to resolve Puerto Rico’s status as an associated free state, suggesting that it is “unsustainable” and to empower Puerto Ricans to determine their political destiny going forward. The bill remains in the introductory phase over one year later, but could be instrumental to Puerto Rico’s future as a state or sovereign nation. Scholars inspired by PRCAP and interested in learning more about the Spanish-American War and its aftermath might consider swinging by the Nettie Lee Benson Latin American Collection to view the Chocolates E. Juncosa Trade Cards, or check out the recent acquisition, Borderline Citizens: The United States, Puerto Rico, and the Politics of Colonial Migration (2018) by Robert McGreevey. Mapping Inequality: Redlining in New Deal America lets users visualize the maps of the Home Owners’ Loan Corporation (HOLC) on a scale that is unprecedented. The HOLC was created in 1933 to help citizens refinance home mortgages to prevent foreclosures. Directed by the Federal Home Loan Bank Board, the HOLC surveyed 239 cities and produced “residential security maps” that color-coded neighborhoods and metropolitan areas by credit worthiness and risk. 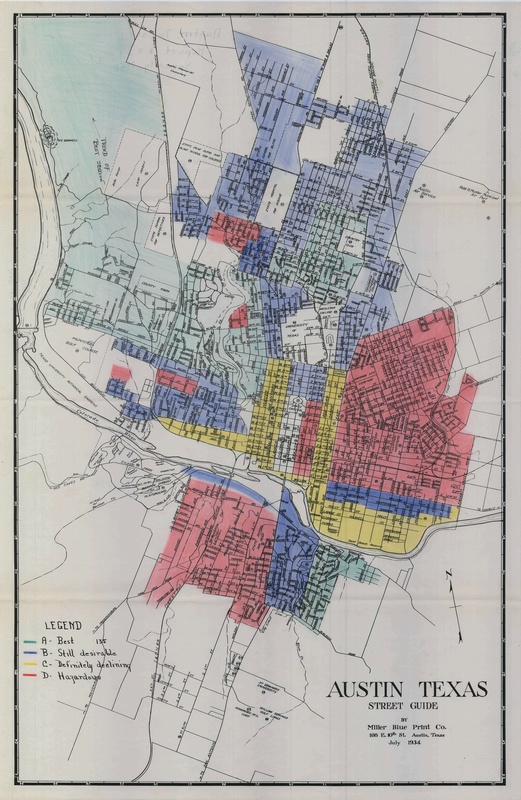 These maps and the discriminatory practice they exemplified and enabled later came to be known as redlining. If you zoom to Los Angeles, CA in Mapping Inequality (I recommend taking a moment to read the short introduction and how to) you will see the historic redline maps overlaid on a web-based map, a color-coded legend that describes areas from Best to Hazardous, and an information panel where you can immediately explore an overview and download raw data. Zoom in further, click a red section of the map, and the “area description” will load in the information panel. The initial view is curated and gives you an immediate impression of how these maps and accompanying documents perpetuated and institutionalized discrimination. You can also view the full demographic data and a scan of the original paperwork. 1935 map of Austin, Texas, with redline demarcations. I chose to highlight this mapping project because redlining maps are a critical example of the power of maps and this interface was beautifully constructed to illustrate their impact. Mapping Inequality is part of American Panorama: An Atlas of United States History. While American Panorama is a project by the Digital Scholarship Lab at the University of Richmond, Mapping Inequality is a product of many collaborations. Participants from universities across the country worked on many aspects of the data collection and transcription and the Panorama toolkit, open source software used to create these maps, was developed by Stamen Design. I also recommend exploring the latest map added to American Panorama, Renewing Inequity: Urban Renewal, Family Displacements, and Race 1955-1966.